I found a cute tutorial for a girl's denim skirt made from an old pair of jeans from TeaRoseHome. I had been on the lookout for a denim skirt for The Girl but never could find one I liked. Everything I found was either a miniskirt or a long pencil skirt. This one had possibilities. Since the skirt in the tutorial was for a girl considerably smaller than The Girl, I needed to tweek it a bit. I also chose to add a ruffled underskirt for additional length and frill. I then turned one of the old jean pockets (and a few other scraps) into a little zippered bag for The Girl to use. I plan to make a stencil from freezer paper and make a bleach print on the pocket of the bag. Then I saw a photo of a denim patchwork pillow from GreenBearCub.com. That's all it was - a photo...no instructions. I decided to create my own using more of the leftover denim. I had a 12" pillow that needed a cover so I only did a 9-patch front. I also made an envelope back so I could easily remove the cover for washing. I'm hoping that with time, the fraying will increase. I've discovered that some jeans fray better than others. I think if I were to make another one, I would leave a smaller seam allowance between the patches, too. Ideas for a backyard barbecue from Lady Behind The Curtain. 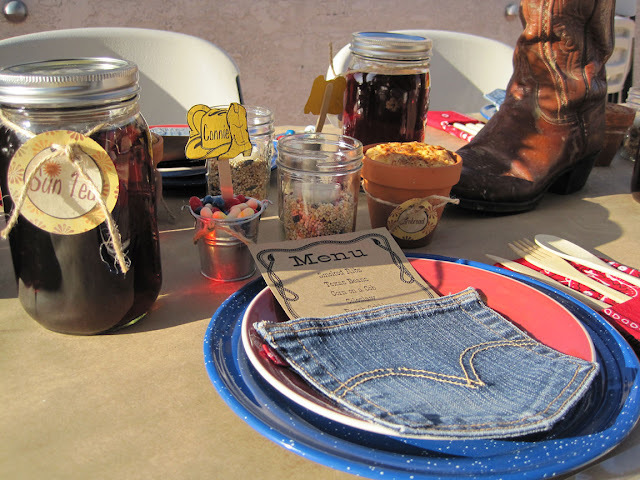 There were not only great decorating ideas, but recipes for your backyard barbecue as well! Fabulous! And as for the denim pockets? Problem solved. I trimmed down the pockets and placed them with the rest of my outdoor dining pieces.